Oil prices hit two-year highs on Monday following bullish news coming from OPEC and the Middle East, further stressing the tremendous impact of geopolitical risk on oil markets. - The Brent-WTI spread recently widened to its largest point in more than two years. In the past, that has meant that U.S. East Coast refineries purchased a lot more domestic crude, shipping it by rail even though that tends to be a costly form of transit. - In fact, in the years when crude-by-rail transit were at its peak, it coincided with a time when WTI traded at a sharp discount to Brent, reaching a high of $27 per barrel. - But the narrowing of the Brent-WTI spread since 2015, when the U.S. crude oil export ban was lifted, led to a sharp decline in the amount of crude oil East Coast refineries purchase domestically. - The recent widening of the Brent-WTI differential, however, is not large enough to justify a large-scale shift from foreign to domestic buying. • Baker Hughes (NYSE: BHGE) saw its share price surge by more than 7 percent after announcing a $3 billion share buyback program. • Chevron (NYSE: CVX) says it will move forward with its first Canadian shale project in the Duvernay shale in Alberta. • An audit of Saudi Aramco’s oil reserves probably won’t be completed before the end of the year, a crucial step ahead of the company’s planned IPO in 2018. Oil prices surged on Monday to their highest levels in more than two and a half years. Brent was up more than 3 percent to $64 per barrel, and WTI jumped to $57 per barrel. Crude prices fell slightly on Tuesday afternoon as markets cooled down a bit. Oil up on Saudi purge, rig count decline, OPEC extension. Oil prices are at multiyear highs as a confluence of events have accelerated the rebalancing process, adding to bullish momentum. 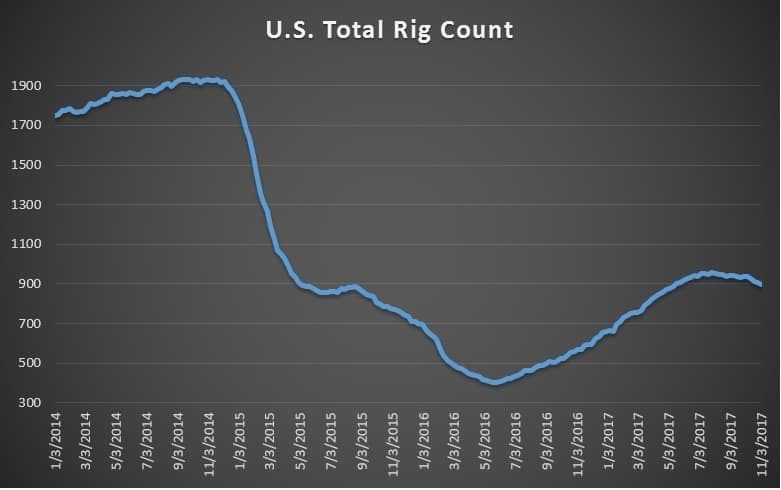 The U.S. rig count continues to fall even as oil prices have gained strength. The steep drop in oil rigs last week pushed up crude prices. The purge in Saudi Arabia (more below) also added some geopolitical anxiety. Related: Can Oil Prices Hit $65 This Week? Royal purge shakes up Saudi Arabia. The surprise purge of top royal figures in Saudi Arabia has led to a tight consolidation of power in the hands of the crown prince Mohammed bin Salman. The move puts the most powerful institutions in the hands of the young prince, who many expect to claim the throne in the coming months if the current King abdicates. The power grab does not necessarily mean much for the kingdom’s oil policy. If anything, it removes dissent to the crown prince’s policies, which include extending the OPEC deal, aimed at raising oil prices in advance of the Saudi Aramco IPO. $70 oil more likely than $50. The oil market has a renewed sense of bullishness, and energy analysts see $70 oil much more likely for Brent than $50. Strong demand, lower inventories and the OPEC deal have all left the market might tighter than at any point in years. Saudi Arabia also seems intent on boosting prices further ahead of the Aramco IPO, and the purge only adds weight to that sentiment. "The Saudi Situation means $70 before $50," Roberto Friedlander, head of energy trading at Seaport Global Securities, wrote in a research note. "The Saudis CAN'T afford a renewed decline in prices or a decline in oil revenues," Friedlander said, adding "they would certainly prefer to risk tightening the oil market too much and see prices hit $70, rather than risk letting them slip back to $50." BP, Shell plan for blockchain trading platform. BP (NYSE: BP), Royal Dutch Shell (NYSE: RDS.A), Statoil (NYSE: STO) and top oil trading companies are working on a blockchain-based trading platform. Blockchain technology uses a shared database that updates in real-time. “Ideally, it would help to eliminate any confusion over ownership of a cargo and potentially help to make managing risk more exact if there are accurate timestamps to each part of the trade,” Edward Bell, commodities analyst at Dubai-based lender Emirates NBD PJSC, told Reuters. HSBC promises $100 billion to fight climate change. UK bank HSBC pledged $100 billion in financing for low-carbon technology through 2025 in an effort to address climate change. It also said it would reduce its support for coal while also expanding the disclosure of the bank’s climate risks. A few months ago, JPMorgan Chase promised $200 billion in financing for clean energy through 2025. Odds of Venezuela default spike. Venezuelan President Nicolas Maduro said last week that he would seek a restructuring of the country’s debt. On Friday, he said he would convened a meeting with creditors on November 13 to negotiate a restructuring. But U.S. sanctions will likely make a deal exceedingly difficult. The country and the state-owned oil company PDVSA owe $1.7 billion before the end of the year and another $9 billion in 2018, a figure that exceeds the country’s total cash reserves. President Maduro, the WSJ reports, may try to preserve the remaining cash the government has in an effort to shore up basic necessities ahead of a 2018 election. In short, there is a decent chance of an imminent Venezuelan default. “This will be the most corrupt, chaotic, and messiest default in the history of defaults,” Moisés Naím, a distinguished fellow at the Carnegie Endowment for International Peace, told the WSJ. Moreover, China and Russia might not help, and instead would battle with bondholders for the remaining crumbs. Oilfield services firms could be hit by Venezuelan default. Several top oilfield services firms, such as Halliburton (NYSE: HAL), face a predicament in Venezuela: Cut their losses and abandon Venezuela or continue to work with PDVSA and risk steeper write-offs. OFS companies and other suppliers have not been paid for past work, and have instead received promissory notes from PDVSA. But the value of those notes have plunged recently as the government seems to have signaled an intention to skip payment. Halliburton, for example, has not received $429 million. Shale companies still aiming to boost production. Despite the pressure from investors to focus on profits and throttle back on drilling, at least seven of the largest U.S. shale companies said that they would try to do both – boost profits and production. That included Devon Energy (NYSE: DVN) and Noble Energy (NYSE: NBL). The announcements suggest that the shale industry, accustomed to drilling at a blistering rate, is not ready to give up on aggressive growth. Anadarko Petroleum (NYSE: APC) is taking a different approach, returning cash to shareholders in the form of share buybacks. It appears the bears are getting bullied on the sea of bullish news. It looks like the scales have tipped into the bulls favor after the 3 years of roundup.